I loved this one! The Mighty Miss Malone has everything in it that I appreciate about children’s literature: style, humor, beauty, depth—even history! I have absolutely no complaints about the story. It does have some incorrect grammar and spellings, but that’s because it’s written from the firsthand perspective of twelve-year-old Deza Malone. I don’t like such inaccuracies in books written for young children (like Junie B. Jones, by Barbara Park), but by fifth grade, the approximate reading level I’d give this one, most students have mastered these skills to the point that they will recognize and laugh at the imperfections. In this case, it adds richness. And is the cover not adorable? 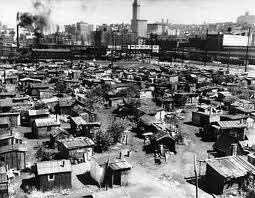 Deza lives in Gary, Indiana with her parents and older brother, Jimmy, right smack in the middle of the Great Depression. Times are tough. Mrs. Malone has a steady job cleaning the house of a wealthy white family, but Mr. Malone’s employment is intermittent at best. They can’t affort to bring Jimmy to the doctor to find out why he stopped growing, Deza’s cavities are so bad her breath reeks and she stuffs camphor-soaked cotton balls in her back molars to numb some of the pain, and the family is reduced to eating buggy oatmeal. Then tragedy strikes. Eventually, Mr. Malone goes off in search of work. Then Mrs. Malone looses her job. She and the children “ride the rails” to Flint, MI in an attempt to find Mr. Malone and end up living in a “Hooverville,” a shack village at the edge of town. 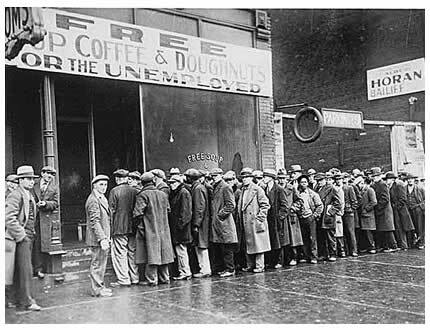 A great Depression bread line. This is a startling look at the Great Depression and a great way for today’s kids to gain insight into that period of history. It’s told from a Black perspective in a day and age when Blacks were basically considered sub-standard citizens and contains many moments or racial prejudice. When Jimmy steals an apple pie, Mrs. Malone is hugely relieved that it wasn’t from a White windowsill, a resulting lynching being implied. The snobby White woman Mrs. Malone works for holds Negroes in contempt and the “letter of recommendation” she writes shows it. 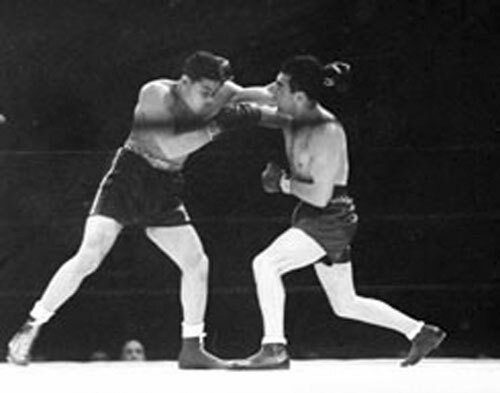 There are also multiple references to the derogatory phrase being a “credit to your race.” But in a great cultural irony, it also features the historical boxing match between Joe Louis and Max Schmeling (One could write a book about the implications of that match!) and shows the tremendous affect it had on both black and white Americans. Overall, the book is clean, historically accurate and beautifully written. Mr. Curtis includes an afterward that sheds some additional light of the boxing match and the history of the time. Then he claims “we haven’t come very far” and compares the plight of today’s “15 million poor Americans” to the Great Depression, calling welfare reform “immoral” and “selfish.” Such political posturing marred this tremendous book for me. Granted, we are in an extended recession, but unemployment today hovers just under the 10% mark. In the GD, it touched 25%! Another 25% could only get part-time work, and pay cuts crossed the board. People were starving to death. Today, we have a welfare subculture, including third generation recipients, and when I walk through the government-subsidized housing in my town, the “poor” have cell phones, pricey exercise equipment, cable, and plasma tvs–luxury items I’ve gone without for years to get ahead on bills (while funding them for others). Can I submit that personal choices and family structure have much to do with economic station? I, for one, still loudly call for reform. Sorry for ranting like that, but that afterward really rubbed me the wrong way. But I can give my 100% support to a fabulously told story. I love this book! I learned a lot about the Great Depression in this book and the book Bud, Not Buddy. I didn’t read the afterword. I guess I have to go back and read it. My Mom and I had a good discussion this morning about what you said was in the afterword – the good and bad stuff about it. I like books that make me think. The book is so, so, so well done. It is one that makes you think. I also really like it when a book lets me “live” a historical experience. This has been on my to-read list since it came out, but I have yet to get my hands on a copy. Will remedy that soon. I already know I will love it. You will love it! It’s excellent. This looks like a great book, I love the cover! I know! She’s so darn cute!